Nigeria: "Ward rounds in the hospital can be quite upsetting"
. MSF is providing a wide range of healthcare programmes in eleven different areas of Borno. I arrived in Maiduguiri about a week before Christmas. My role as a paediatrician is to help out in two of MSF’s projects here. One project is a 35 bed general paediatric unit and the other is an 80 bed inpatient therapeutic feeding centre that caters for malnourished children up to the age of ten. Two things have really struck me since I arrived; the number ​of children admitted to hospital with vaccine preventable diseases and also the number of malnourished infants less than six months old we are seeing. 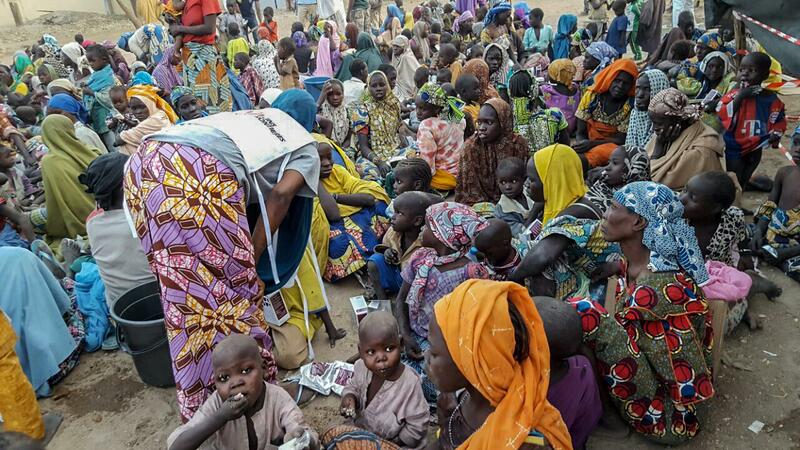 Maiduguiri has been a refuge for people fleeing the fighting in other parts of Borno state. It’s estimated that there are over a million internally displaced people here, on top of the one million plus who already lived here. Imagine if an extra one million people arrived in Dublin over a few weeks and how overwhelmed the healthcare infrastructure, sanitation and other systems would be. The hospitals here are frequently full, so our inpatient units are very much needed. Due to the insecurity caused by the fighting, it has been extremely difficult to run effective vaccination campaigns in the past few years. We see large numbers of children with measles, whooping cough and pneumonia. When illnesses like these are combined wit malnutrition, the result can be fatal. Laura Heavey examining a child suffering complications from malnutrition. I had an 8-month-old patient with severe measles. Vitamin A is used up by the immune system to fight the measles infection, so children can become deficient very quickly. Vitamin A is also essential for vision and extreme deficiency can lead to blindness. This baby had signs of severe eye disease and she couldn't open her eyes for two weeks. Fortunately, she was admitted to our feeding centre where she received vitamin A supplements and made a full recovery. I also see tiny malnourished infants every day in the feeding centre. They all have the same heartbreaking story; a mother who died shortly after delivering them into the world. Without someone to breast feed them, these infants become sick very quickly. 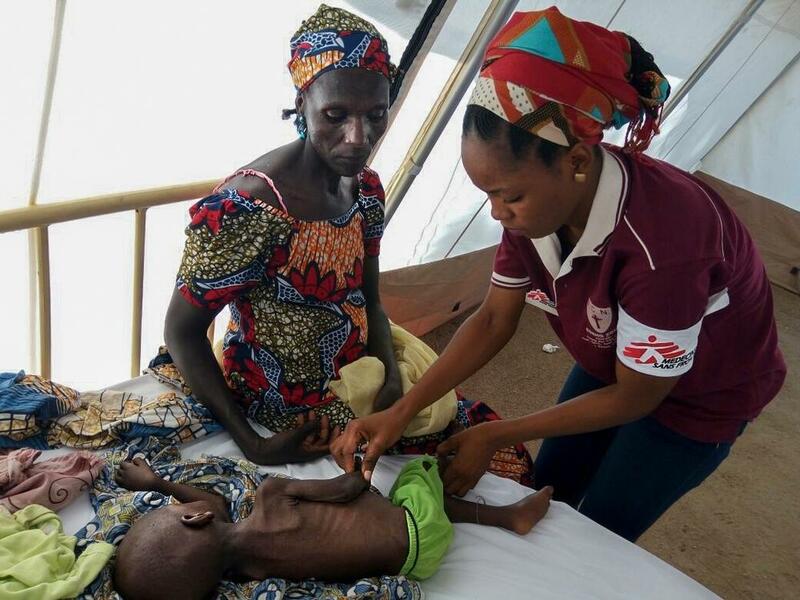 MSF medical staff member attending to a severely malnourished child in Borno State. The lucky ones have another female relative who can act as a wet nurse. Infant formula is too expensive for many families to afford so if there is no one eligible to breast feed, these babies end up in a life-threatening situation very quickly. I frequently see 3-month-old babies who weigh only 2kg, which is less than most Irish babies weigh when they are born. Maternal deaths are also a common occurrence due to a lack of antenatal care and home births. MSF also supports two maternity units here in Maiduguiri to help improve the situation. Some of the women have stories of being severley mistreated while being held in captivity. Sometimes ward rounds in the hospital can be quite upsetting, as you hear the traumas that people had to live through, like those of the women whose husbands were killed and who were then captured and forced to work as cooks or helpers. Some of the women have stories of being severely mistreated while being held in captivity. I am amazed on a daily basis by the resilience of these mothers. 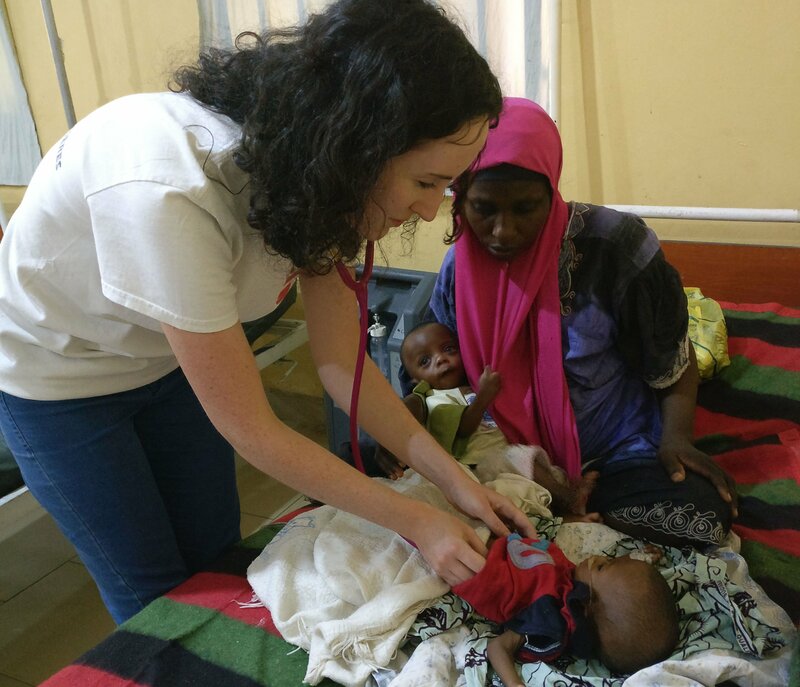 More people are arriving in Maiduguri, often without having had access to healthcare for months, so we are still seeing a lot of severely ill people. The harvest happened before Christmas, but everyone is worried that malnutrition will increase again in April when the harvested food starts to run out. South Sudan: "He is two but only weighs as much as a few-month-old baby"